The area of the Pnyx is reshaped by the construction of a monumental semi-circular retaining wall and from then on the convening citizens have their backs turned against the city. Upon the Hill, begins the erection of two stoas that would delimit the area to the south of the Assembly Place. It seems as though their construction remained incomplete, whereas a while later the assembly of the Athenians was transferred to the theatre of Dionysos. Kourouniotes and Thompson 1932, 90-217; Travlos 1971, 466-476. Top: View from the Pnyx overlooking Piraeus. Drawing by the British architect and archaeologist Charles Cockerell, taken from the series “The Antiquities of Athens”, vol. V (1830). 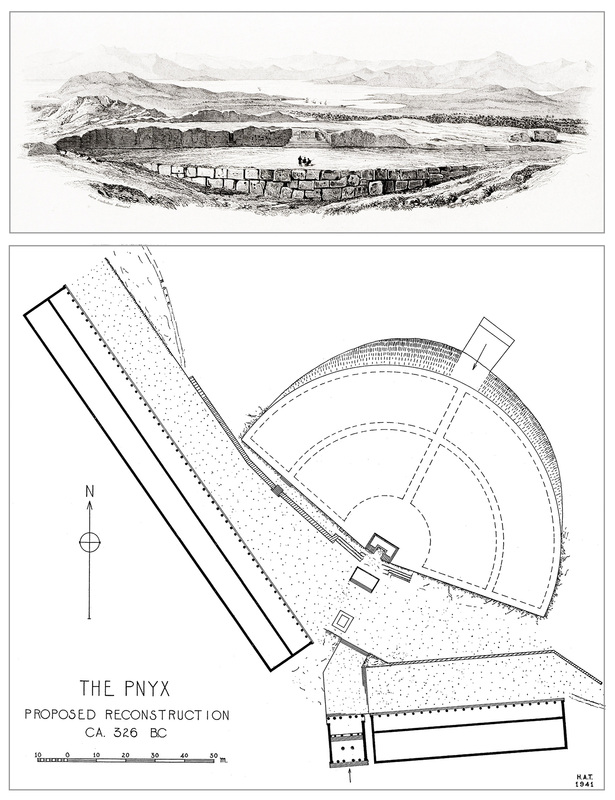 Bottom: Reconstruction of the Pnyx in a drawing during the 3rd building phase, circa 330 B.C. The excavations in the area of the Pnyx were undertaken by H. A. Thompson and R. L. Scranton in cooperation with K. Kourouniotes, in 1930–37.